2007: Graduated from the Russian Presidential Academy of Public Administration with a degree in State and Municipal Administration and specialization in Social Affairs Management in the Russian North. 1990: Began working as a children’s arts coordinator at the Integrated Research and Methods Center of Folk Arts, Culture and Education of the Ministry of Culture of the Republic of Sakha (Yakutia). 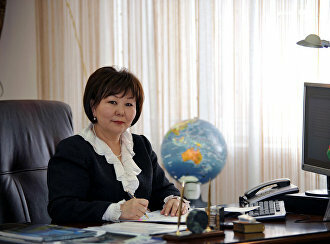 1994: Appointed Deputy Director of the Yakutian Culture and Arts College in charge of the Education and Consultation Center of the East Siberian Academy of Culture and Arts (VSGAKI), Dean of the Yakutian Branch of VSGAKI and (since 1999) Director of the VSGAKI Representative Office. 2000-2008: Dean of the Department of Information and Library Technology and Management at the Arctic State Institute of Arts and Culture (ASIAC). 2008: Elected Rector of the Arctic State Institute of Arts and Culture. 2013: Re-elected Rector of the Arctic State Institute of Arts and Culture. Sargylana Ignatyeva holds a teaching and research position at AQSIAC’s Faculty of Management, lectures on Innovation Management Methods, and is leading a new research project on the theory of human capital and its application in culture.